Yes there is support for SQL 2008 R2 , Soon all products are supported. But remember not all third party’s are ready for SQL 2008 R2. The support is divided into two phases. 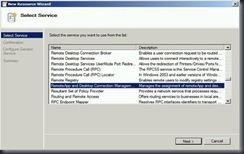 Phase one supports new installations of System Center Operations Manager 2007 R2. Phase two supports upgrading an existing System Center Operations Manager 2007 R2 deployment to run on a SQL Server 2008 R2 database. 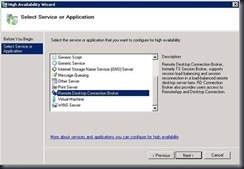 The existing deployment has database roles hosted on a Microsoft SQL Server 2005 Service Pack 3 (SP3) server or on a Microsoft SQL 2008 Service Pack 1 (SP1) server. You are receiving this invitation based on the quality of feedback you have provided on previous Windows programs and the Microsoft Windows release team would like you to participate in the Microsoft Windows 7 and Windows Server 2008 R2 Service Pack 1 (SP1) release program, to be available shortly, as announced at the Microsoft’s TechEd conference. Accepting this invitation will allow you to access pre-release versions of the Service Pack for the purposes of validating the release readiness. We highly value your past feedback and know we can count on you again to help us build a great new version of Windows! The SP1 release version is not available quite yet but we need to assemble a great team of program peers early so you are ready to go when we are! If you accept this invitation you’ll be notified when the release version becomes available. • File bugs if you encounter them as well as respond to surveys as you can. A failover cluster is a group of independent computers that work together to increase the availability of applications and services. The clustered servers (called nodes) are connected by physical cables and by software. 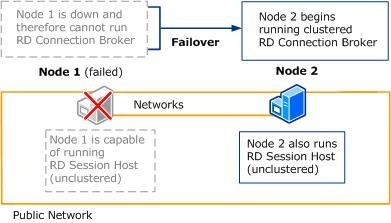 If one of the cluster nodes fails, another node begins to provide service (a process known as failover). Users experience a minimum of disruptions in service. 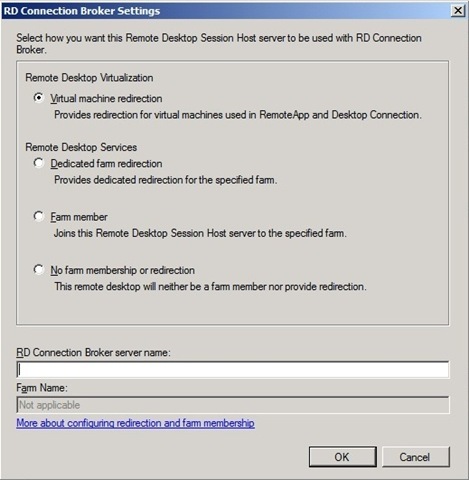 This guide describes the steps for configuring Remote Desktop Connection Broker (RD Connection Broker) in a failover cluster, as part of a configuration that provides users with access to personal virtual desktops or virtual machines in a virtual desktop pool through RemoteApp and Desktop Connection. 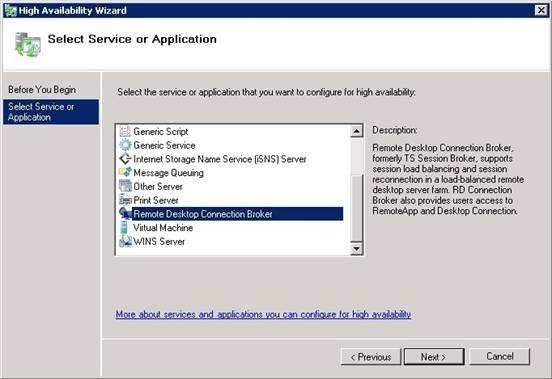 As you work with the configuration in this guide, you can also learn about failover clusters and familiarize yourself with the Failover Cluster Manager snap-in in Windows Server 2008 R2 Enterprise or Windows Server 2008 R2 Datacenter. 1. 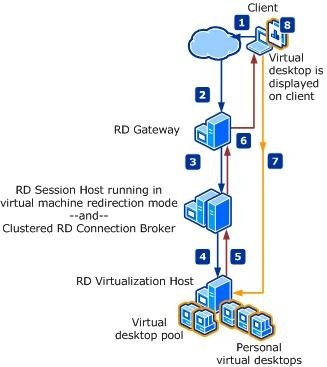 The user requests a connection to a virtual desktop, either a personal virtual desktop or one from a virtual desktop pool. 2. The RD Gateway receives the request. 3. 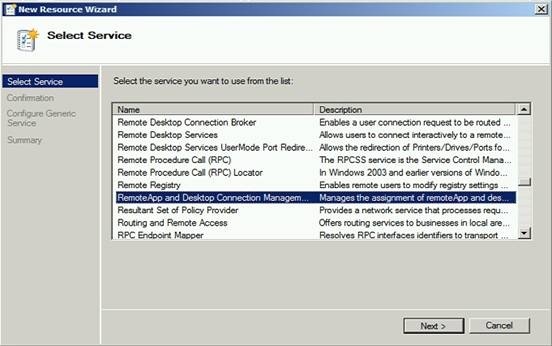 The RD Gateway sends the request to a virtual machine redirector (that is, RD Session Host running in virtual machine redirection mode). 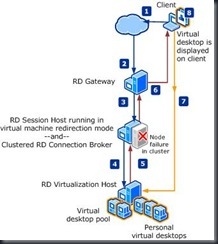 The virtual machine redirector informs RD Connection Broker, and then waits for the IP address of a virtual machine. 4. 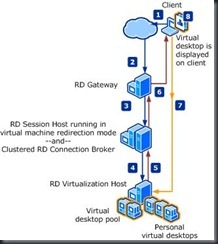 RD Connection Broker requests information about a virtual machine from the RD Virtualization Host. 5. 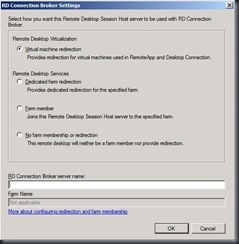 RD Connection Broker receives information about a virtual machine and then provides that information to the virtual machine redirector. 6. 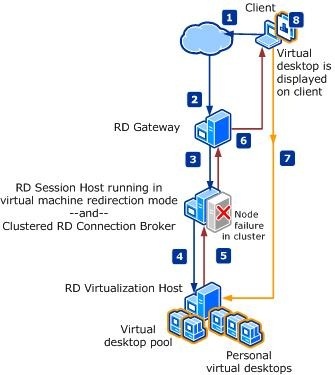 The virtual machine redirector communicates through the RD Gateway, providing the client with the IP address and connection information for a virtual desktop. 7. 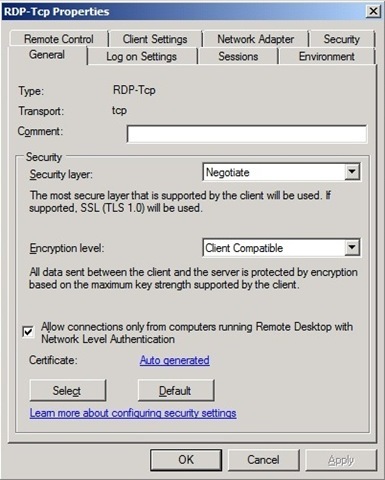 The client connects to a virtual desktop. 8. 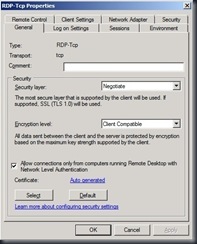 The virtual desktop is displayed on the client. The following illustration shows the same sequence of events occurring despite the failure of one node of the cluster. 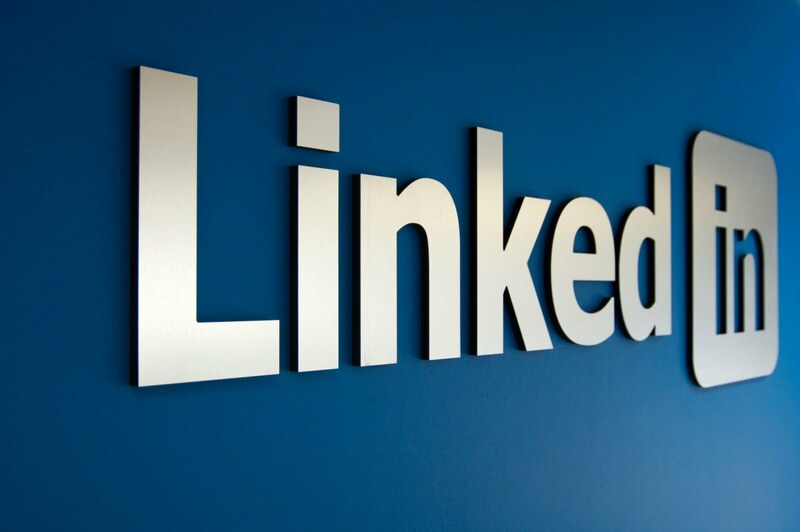 Because a second cluster node is still running, it can respond to client requests as they occur.